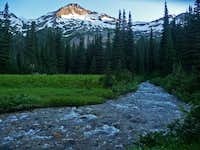 The Glacier Peak Wilderness is a fantastic area of rugged mountains stretching from Stevens Pass Highway 2 to North Cascades National Park. 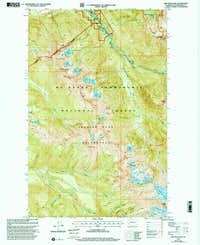 It is one of the larger wilderness areas in the country at 572,000 acres of remote mountains. 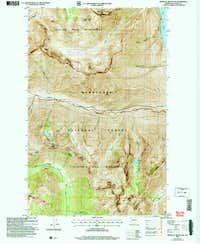 Washingtonians and outdoor enthusiasts are very lucky to have this area protected. 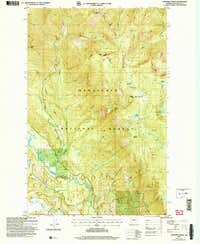 Nearby Wilderness areas that also protect our great mountains include the Mt. 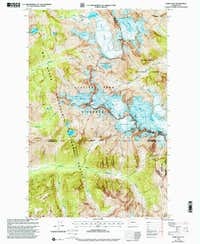 Baker Wilderness, the Henry M Jackson Wilderness, the Wild Sky Wilderness, the Lake Chelan-Sawtooth Wilderness and North Cascades National Park. 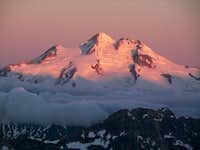 The centerpiece of the Glacier Peak Wilderness has to be Glacier Peak itself which towers above all nearby mountains with its abundance of glaciers at 10,541 feet in elevation. 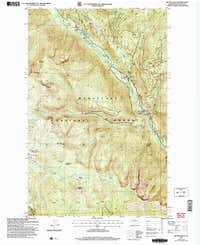 Many Washingtonians would agree that the Glacier Peak Wilderness along with the Alpine Lakes Wilderness and North Cascades National Park make up one of the, if not the best stretch of mountainous terrain in the lower 48 states. 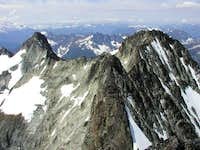 There is a plethora of stunning peaks to climb in this area and while many mountaineers work to climb the Bulgers, countless more peaks that don't quite make the elevation cutoff to be considered a Bulger await you. 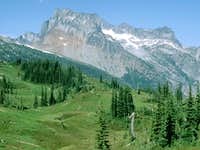 Even the people out to simply enjoy a nice hike, the Glacier Peak Wilderness will not disappoint as the trail network is superb. 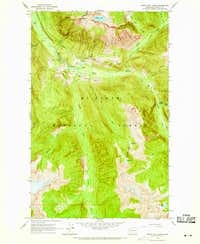 Shown below is a map of the Glacier Peak Wilderness. 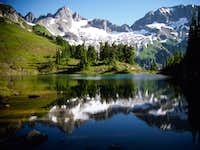 There are many ways to enter the wilderness and hundreds of miles of trails that can take the avid backpacker through the dense forests below tree-line and into the heart of the alpine terrain surrounding Glacier Peak. This road bears off to the southeast from the North Cascades Highway 20 in Marblemount. This small town offers a couple gas stations and a few places to eat but don't expect much more. 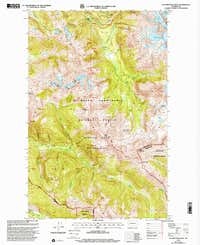 There is a ranger station near town where you will have to pick up free camping permits if you plan to visit North Cascades National Park which is also accessed by this trailhead. From the east end of town right before the highway makes a sharp left turn, continue straight onto the Cascade River Road and cross the Skagit River. Continue for 14 miles on pavement and another 6 miles on good gravel where you'll pass the small trailhead parking area and privy for Eldorado Peak at mile 20. Shortly past this trailhead the road will make a sharp left hand switchback and start climbing steeply. There is a very small parking area by a gate at this switchback for the old trail heading up the Middle Fork Cascade River. Follow the steep road as it climbs into the North Fork Cascade River valley and reaches the Cascade Pass trailhead at mile 23 where the road ends. A half mile before this is the trailhead for Forbidden Peak where a small pull-out allows a few cars to park. The Cascade River Road takes at least 45 minutes to drive from Marblemount to its end, 23 miles later. 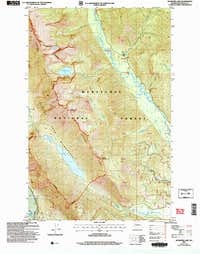 For access to the peaks and areas in the eastern half of the wilderness area it is best to take the Lady of the Lake ferry service from the town of Chelan to the Lucerne stop. Getting off the ferry at Lucerne and taking the bus up to Holden Village is a very enjoyable way to start a trip. Some of the best backpacking in the area is found here. 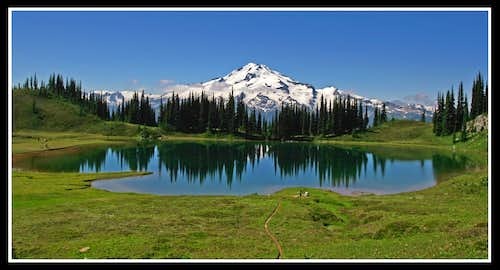 Start on the Hart Lake trail and this will take you below the towering Bonanza Peak and the area surrounding Lyman Lakes. Continue further over Cloudy pass to Image Lake for some truly amazing scenery. This part of the wilderness is by far the most popular however it is also some of the most scenic. You may have trouble finding solitude here but it is still well worth a trip. If you decide to get off the ferry at Stehekin, you will be entering the North Cascades National Park (permits required) but this will give you access to the Mount Logan Group. You will have to take a shuttle from the town of Stehekin up the Stehekin River Road which is currently closed at the Dolly Varden campground. The east side of Cascade Pass as well as the Brush Creek Trail/Horseshoe Basin, the Pacific Crest Trail and the Park Creek Trail are all accessed by this road. 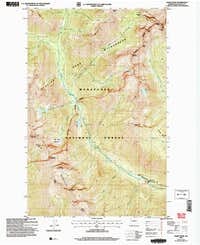 The Trinity gate and Phelps Creek Trailhead/FS Road 6200 is another fairly popular access point as it provides another way to the popular and scenic area around Lyman/Image Lakes and Spider Gap. Following the Phelps Creek Trail through the meadow is a beautiful hike. Beware this road can be rough on passenger cars as it is very long and rocky although low clearance vehicles will be able to make it up this road. From Seattle head north on I-5 to Everett and follow US Highway 2 to the Coles Corner Junction with WA Highway 207. Follow Highway 207 until it crosses the Wenatchee River. Just past the bridge head north onto Road 62 towards Fish Lake. Follow Road 62 past the Grouse Creek Campground and continue onto Road 6200 as it parallels the Chiwawa River. This is a long rough road that ends at the Trinity Gate where the Buck Creek Trail starts (elevation 2,900 feet). For access to the The Phelps Creek Trail turn right onto FS 6211 at a signed junction just before reaching Trinity and switchback a couple times up the hill reaching the end of the road at 3,500 feet elevation...one of the highest trailheads in the Glacier Peak Wilderness. 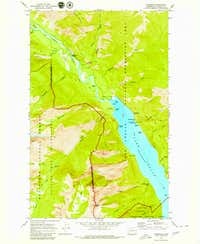 Another access point from Lake Wenatchee is to continue on Highway 207 until it ends and continue onto Road 22. This quickly turns into Road 167 and ends at White River Falls. The White River and Indian Creek trails head in a northwest direction from here. Continuing on the Boulder Pass Trail will take you towards Clark Peak. This loop road encircles peaks to the west of Glacier Peak and starts Arlington on the NW corner of the loop. It then heads east to Darrington, then south to Granite Falls and back west to Lake Stevens. Branching off to the southeast from the Mountain Loop Highway is Road 49 located at the Bedal Campground just after Barlow Pass if coming from Granite Falls. 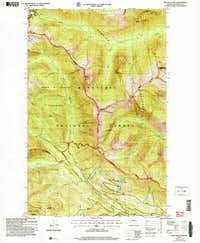 This is a very long but decent road that gives primary access to Glacier Peak, Sloan Peak and the North Fork Sauk Trail as well as the Lost Creek Ridge Trail. Unfortunately this road is closed however, heading south from Barlow Pass is the Monte Cristo Road leading to the old mining town of Monte Cristo. 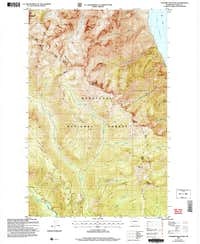 This 4 mile road must either be walked or biked due to large washouts but it provides access to peaks like Columbia, Monte Cristo, Cadet, and Del Campo. This trailhead is the southern end of the Ptarmigan Traverse. Usually people end their trek here while starting at the Cascade Pass trailhead. Unfortunately this road is still closed at mile 12.5 leaving a 10 mile walk or bike from the closure gate to the Downey Creek Trail. This used to be the standard approach to Glacier Peak but once this road closed, Road 49 became the new standard. What really stinks is that this road is still driveable nearly the entire way to Downey Creek. A washout damaged the Downey Creek bridge and the Forest Service just decided to close over half the road. 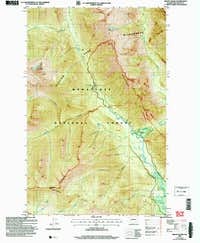 From Darrington, continue north on Highway 530 for 8 miles and turn right on the Suiattle River Road. 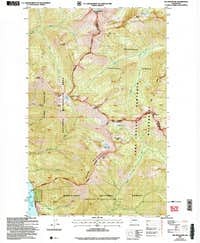 You will quickly cross the North Fork Sauk River then follow the paved road for 10 miles at which point it turns to gravel. After another 2.5 miles you reach the gate where there is ample parking along the side of the road. The Downey Creek Trail starts 10 more miles up the flat gravel road. 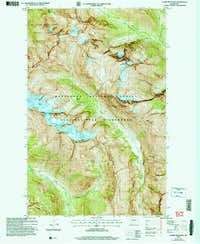 Use this trail for approaching Dome and SInister Peaks and/or the Ptarmigan Traverse. 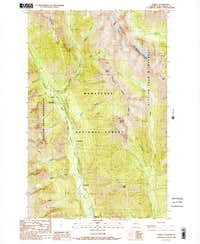 Below is a table of the USGS Quads for the Glacier Peak Wilderness ordered as they would appear on a reference map of Topos. Just click on the one you wish to see and view its full size. 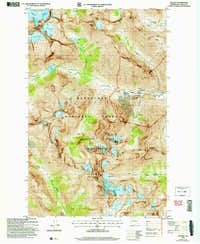 An inconceivable amount of lakes and trail hikes can be seen for those who don't have summit fever. 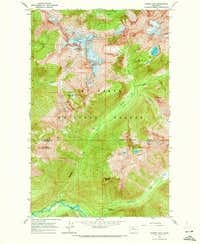 The best ones would be the Phelps Creek and Spider Gap hike, the Lyman Lakes/Cloudy Pass hike and Image Lake. Spectacular scenery and lots of lakes can be seen around this area although solitude may be hard to come by in summertime. 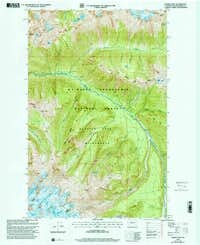 Another great area with a little more solitude is the Buck Creek Pass/Chiwawa Ridge area to High Pass. 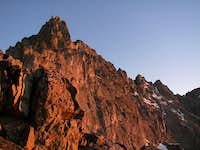 A hike up to Cascade Pass and the Sahale Arm (but no further) would also make for a very scenic hike that won't require special gear. In general the "hiking" season starts when most of the snow melts off the trails. This varies year to year but generally by mid-July many trails are clear. Spring is Cross country skiing season for all the avid skiers and winter is strictly for those looking for adventure. Winter gear, snowshoes and ice axes are a must for winter ascents. Don't expect many views either as it is usually cloudy and foggy all winter in the Cascades. Late summer and early fall is obviously the best time for long backpacks and the Glacier Peak Wilderness can provide treks that you will never forget. 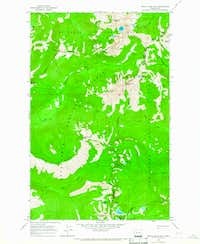 This is wilderness area however camping pretty much anywhere you won't damage alpine meadows should be fine. Campfires are only allowed below 3500 feet in elevation so don't make any above treeline. 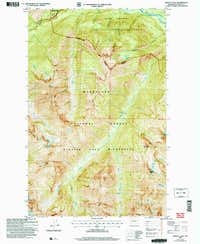 There are numerous designates campsites on the trails below treeline that should be used if possible otherwise leave no trace and be careful where you camp if you are above treeline. The old mining town of Holden Village is now a church based summer camp with cabins and a cafe for the people who prefer their outdoor experience in this fashion. Many backpackers also stop here at the beginning/end of their treks. 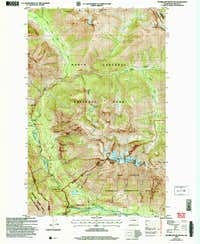 A Northwest Forest Service Pass is required to park your car at any of the above mentioned trail-heads. No motorized vehicles of any kind are allowed within the wilderness. 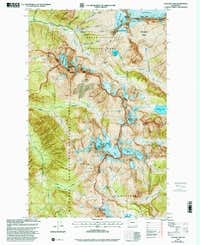 For an excellent map of the entire wilderness get the new National Geographic Trails Illustrated map of the Glacier Peak Wilderness. 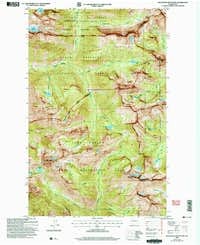 This is a new map and is replacing the Green Trails maps used in the past. For a hiking guidebook see Erik Molvar's A Falcon Guide Hiking the North Cascades. 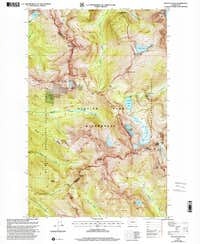 This is a great resource for hikers who like to stick to trails and has great photos. 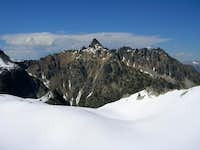 It includes hikes in the Glacier Peak Wilderness, the Mt. 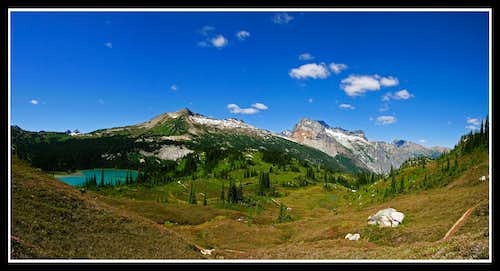 Baker Wilderness and the North Cascades NP. For an even better hiking guidebook, see Ira Spring and Harvey Manning's 100 hikes in the Glacier Peak region. 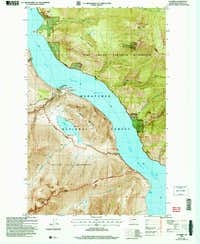 Another great resource for casual hikers looking for great places to explore. 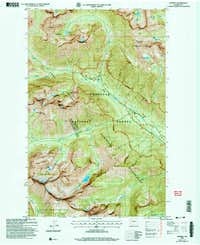 For a mountaineering guidebook see Fred Beckey's Cascade Alpine Guide second edition covering from Stevens Pass to Rainy Pass. 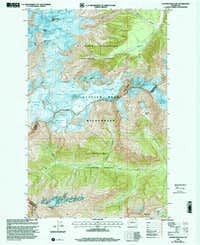 The bulk of this book covers the alpine terrain and summits in the Glacier Peak Wilderness. 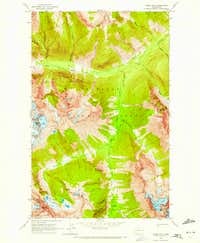 It is the best guidebook for the area and is designed for cross country high alpine travel. 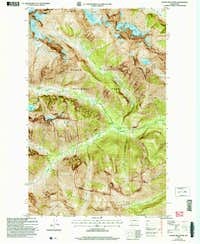 For a good general map of the area, see the National Geographic Trails Illustrated Glacier Peak Wilderness map.